If you are keeping up with the blog, you probably know that I have done several projects to decorate my home bar. You can click on the image to read the post where it all started (the image is a little fuzzy). 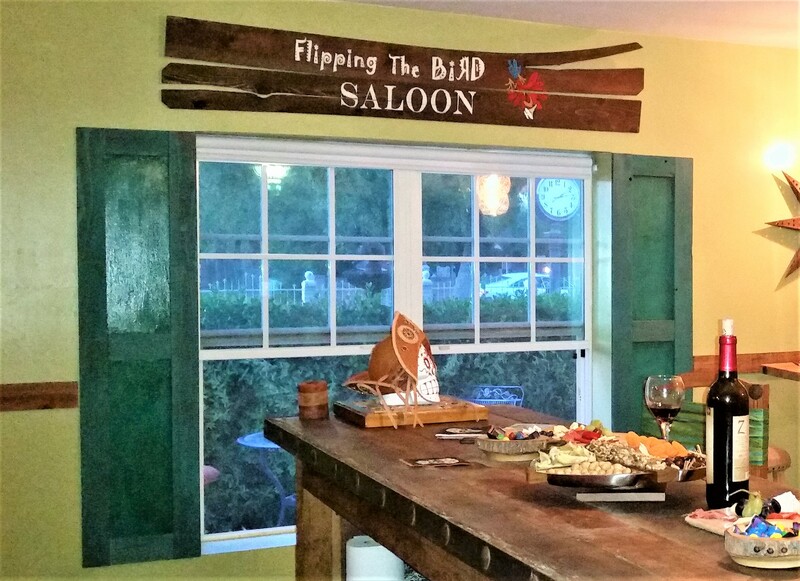 Since we (me and my husband) rescue birds and find them “forever homes” (basically, we rescue, rehab them and then find them homes), we decided to name the bar “Flipping the Bird Saloon“. It is a name play with flipping homes where you rehab them and flip them, and rescuing birds and giving these birds a second chance. Yes, as a guy, my husband sure had a kick with the name. Hence, the image of the bird with his eyes “bugged out” on the sign (is that a word?). If you click on the image you can see the tutorial for the sign. As I mentioned, the bar is still a work in progress and I will soon share more tutorials but the one tutorial I want to share today is the rustic farmhouse indoor shutters I created to add some personality to the room. (4) 1x4x8 boards for the vertical cuts (you can also use dog-eared fence boards for a very rustic finish). 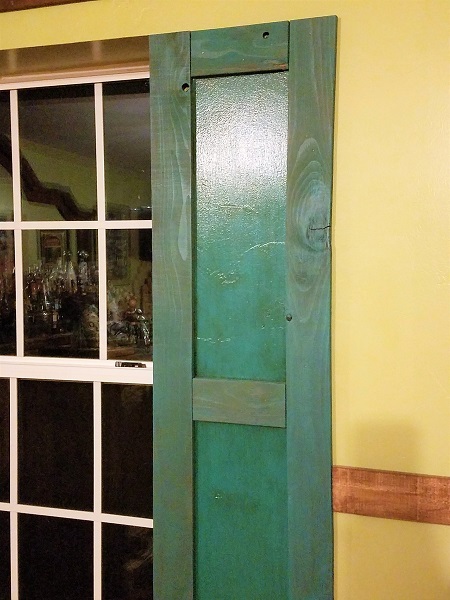 (1) 1x4x8 board for the horizontal cuts (you may need another board depending on how wide you want your shutters. Nail gun and 1 1/2 in nails (another option is to hand nail with finishing nails if you don’t have a nail gun. I would not use liquid nails but that’s another option if all fails). 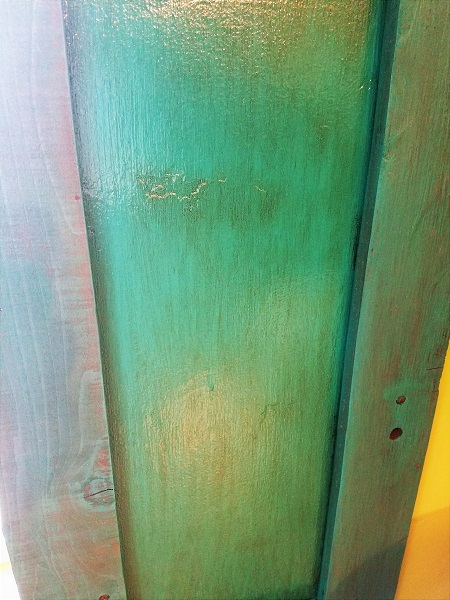 Paint – I just needed 1 pint (the color I selected was “Intense Teal” by Behr). My home bar is located in a room with a view to the front yard. 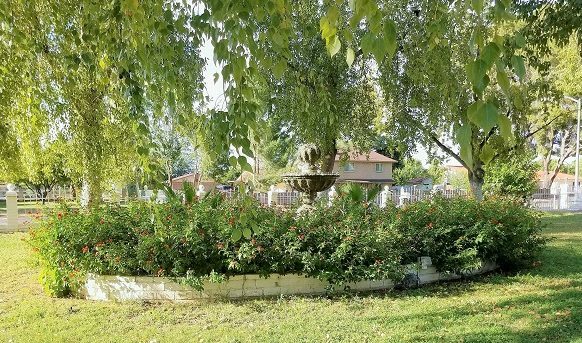 I am blessed to have a large circular driveway with a nice fountain in the middle of the circle. I love watching the birds drink water and take their baths during the hot summer days of Arizona. I felt that putting a curtain on the windows would take that away a little. Also, it is a very rustic style bar and any curtains there, even if I used burlap would just not look right. So, I decided that shutters would give the personality I needed and it would still match the decor. The first step is to measure the opening of your window (vertical). 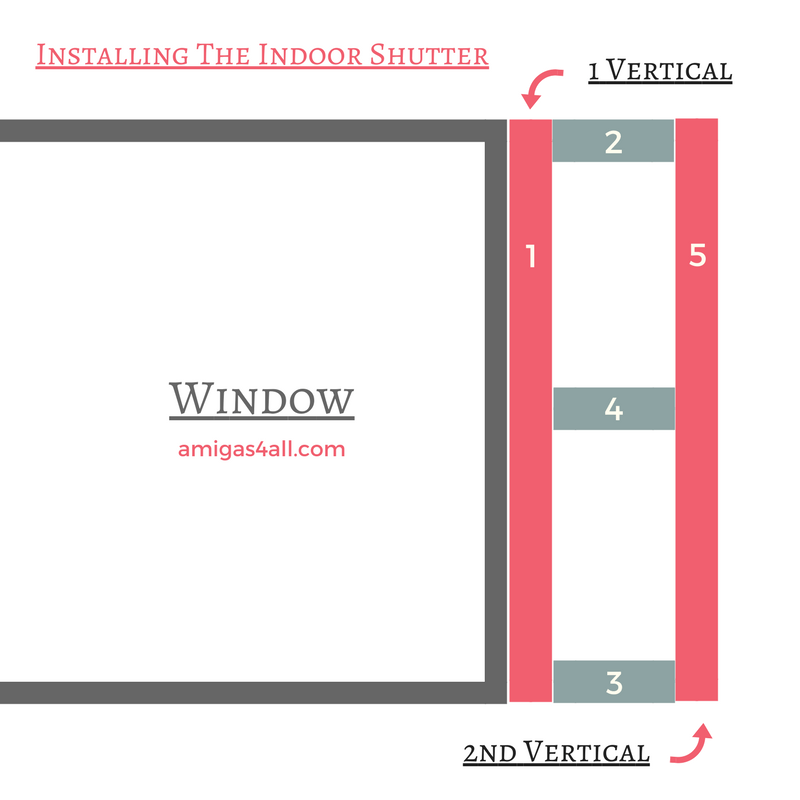 Of course, the indoor shutters will look better if your window does not have any trims around them. But if you do, you can consider removing them or making them work with your shutters. Start with the vertical cuts. You will need 4 cuts of the same size. Two per side of your window. My window is 59 inches tall. So I cut my boards at exactly 59 inches. The horizontal cuts are going in between the vertical cuts. You have to decide how wide you want your shutters. 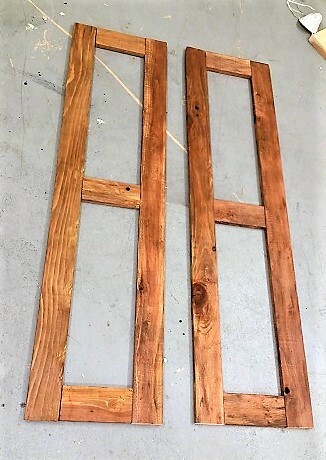 For my window, I decided that I wanted them about 16 inches wide total (Each vertical board is 4in plus 8 inches for the horizontal board= 16in). Since I wanted one board for each end and one in the middle of the shutter I cut 6 pieces at 8 inches long. 3 horizontal boards for each side of the window. First, you need to sand the boards with the sanding sponge or paper. Then it was time to paint the boards. I applied paint over the boards. However, since I wanted them to look rustic, I did not paint more than one coat. 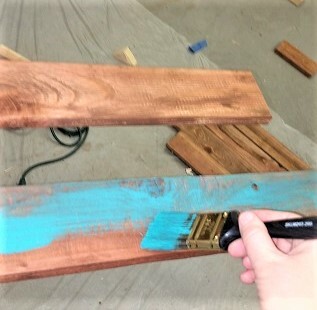 You can put a lot of paint on the brush and work the paint over each board in the direction of the grain (without assembling the window, of course). The paint doesn’t have to cover the board perfectly. Here is another closer look after the paint dried. This is a very easy process to do. It is, of course, much easier if you have a side-kick to hold the boards while you nail them. Especially, if you don’t have a brad nailer and you have to do it the old fashioned way (Yep, the good ol’ hammer, baby!!). Start by lining up your vertical board near the frame of the window, directly onto the wall. Be sure to line up with the top and bottom. Also be sure it’s not crooked. You can always use a level to help you. It will be easier to maintain everything lined up if you start the first board completely level (vertical, of course!). Follow the sequence in the image above for both sides of the window and voila! The shutters are installed. Since this is a “faux Shutter” and I didn’t want to add more steps to the project, the only final step is to paint the wall inside the gaps between the boards. In my project, I wanted the shutters to have the same color throughout. Imagine you are creating a white shutter and you sanded it to make it all rustic and “chippy”. How do you create this “chippy” look on the wall? Since my walls were a light green and I didn’t add any wood panels in between the boards (Yes, you can do that with a thin sheet of plywood. I skipped this step). I had to create a “faux” wood look to make it all match. 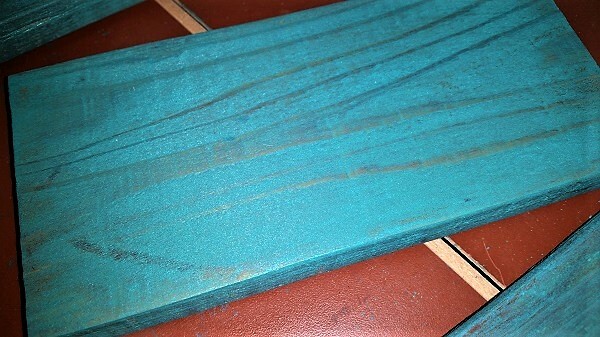 I first painted the wall inside the boards the same “Teal” color I used for the boards. Let the paint dry. Apply a second coat of paint (you don’t want the color of the wall showing). 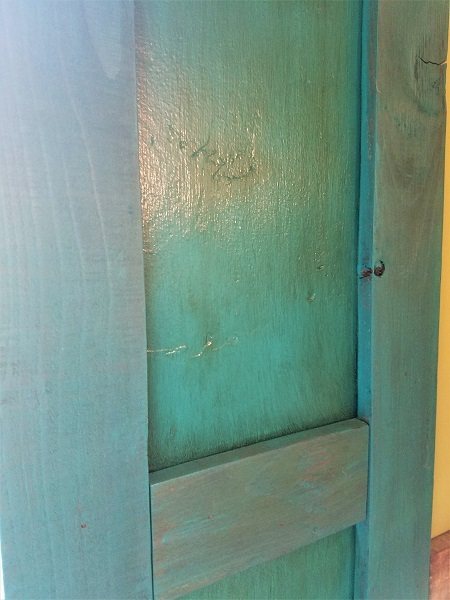 To make it look like there was a wood board of similar tone in the gaps, I used a dark wood stain and used a rag to “stain” or “age” the “Teal” color on the wall. Here are some daytime and night time pics. The light outside kinda changes the color a bit and same with the indoor light but you get the picture (pun intended!). It’s like doing the reverse of what we did for the boards and the wood, where the wood would show in between the light coat of paint instead of painting the wood. Makes sense? It may take a while for the stain to dry, so don’t touch it for a day or two or you will see finger marks on the surface. That’s it! Now the room is full of personality and it matches the decor of my bar (Sorry about the angle of the picture, It’s a long room and the bar takes 70% of the room). You can try an antique white or cream if you are going with the light color farmhouse look. Light yellows or sky blues could also work. A final note: This project cost me less than $20 bucks. You can find the boards from $1.20 to $4 depending on how fancy you want the boards to be. I chose a simple pine board for about $2.05 each. I already had the paint from another project (a pint will cost you about $5 or you can buy a can or two of sample sized paint since you won’t need much if it’s just one window). I also had the stain, but you can buy a small can for less than $5 dollars. Not too costly and the room looks spiffy! I hope you liked this post. Follow us on Facebook and Pinterest for news and updates and sign up for our email list to receive the latest projects from the blog.